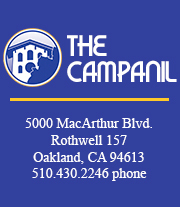 The Campanil is the only student-run, multi-platform news organization at Mills College, a private liberal arts institution located in Oakland, California. The print newspaper is funded through a combination of advertising revenue and a portion of the undergraduate student activities fee. Established in 1917, the newspaper underwent several name changes throughout the years, including The Weekly and The Stream. When The Campanil confirmed its current title in 2007, it committed itself to experiment with new methods of storytelling. Today, we continue to do so. Our current website, for example, was launched in September 2009, and we have made vast forays into multimedia and communicating via social networks. Above all, we strive to engage and interact with Mills students present and past, faculty and staff as well as the local community on issues of importance. The mission of The Campanil is to serve the Mills College community through the practice of ethical and responsible journalism. Knowledge and progress in all areas of life are accomplished through the sharing of correct information. The Campanil strives to accomplish this standard by reporting and writing the truth in a way that enlightens and informs our entire community, while providing information in a manner that seeks participation through thoughtful response, dialogue and action. Our clear objective is to serve the student body and we realize the importance and impact of this endeavor. We do not make news but cover the events that stimulate and change our community and college life. The Campanil‘s faculty adviser is Sarah Pollock. Our print newspaper is produced biweekly (every two weeks), with a circulation of 1,000. New issues are distributed and can be found throughout the Mills campus, particularly at Adams Plaza, Mills Hall, Founders Commons, F.W. Olin Library, Lucie Stern and residence halls. Is there a location lacking in papers? Let us know by emailing eic@thecampanil.com. Need a paperless option? We publish each print copy as a downloadable PDF on Issuu.com.